Weather. We're obsessed with it. It's right there outside your door when you head to work and it seems to be a point of obsession. It is the subject of so many of our conversations. Earlier this year, I had my first (and only) significant Twitter moment in which a tweet I posted was retweeted more than 75 times. (Not huge compared to actual Twitter celebs, but more RTs than I ever had on a single post.) The topic? The weather. So if you're going to check the weather every morning, why not change things up? 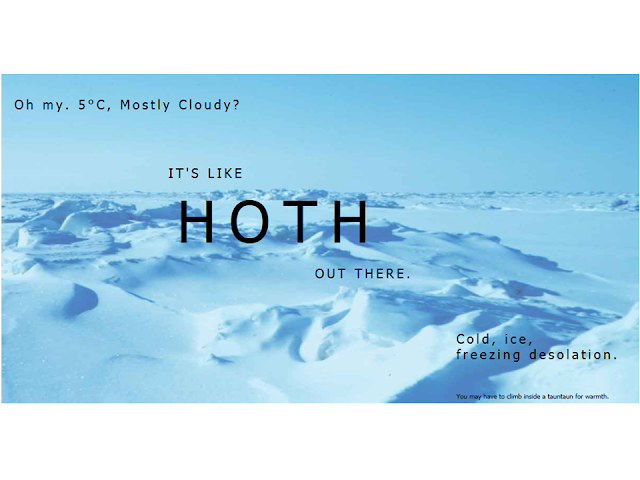 Chris Pirillo tweeted a link to a site that turns this daily chore into a sooper nerdy experience: The Star Wars Weather Forecast. Unlike the name implies, it doesn't tell you what the weather would be on a given planet, it actually tells you which planet today's weather most resembles. 19 degrees and cloudy? Sounds like Yavin 4. A much more interesting way to start the day, don't you think? Check it out!